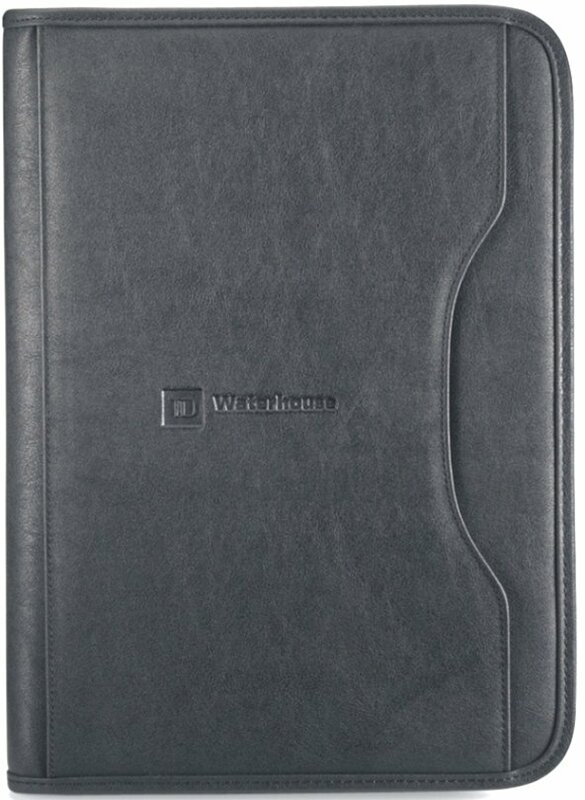 At this low cost for a full size padfolio get a logo debossed on the Deluxe Executive Padfolio. business card display pocket, pen loop, outside pocket & a 8 1/2 x 11 writing pad. Overall size of the Deluxe Executive Padfolio is 10 1/4" w x 13 3/4" h x 1" deep. Normal delivery from date of an order for this padfolio is 2-3 weeks. We have a transcribers conference every year and I selected the Deluxe Executive Padfolio for this years February event. Promotional Items, Inc. seems to only feature the good stuff. I am more than happy with this gift padfolio and am certain every one at the upcoming event will be as well. Our rep was very helpful taking care of the order, delivered it faster than promised, our logo never looked better debossed and the overall quality of the product is fantastic. I am very happy and satisfied.